To get the obvious main talking point out of the way first, yes it was a dive by Moses and a cheap penalty but that can't hide the fact that it was a disappointing second half for the Swans. After a fantastic first 10-15 minutes especially where a series of great passing moves with Bony as the fulcrum cut through Stoke a number of times the momentum was more with Stoke from Swansea's goal onwards. I think at some point having both Bony and Gomis on at the same time could cause real havoc, but was surprised it was a combination used in this game given Bony's international travels. You could argue it was a positive move to try and win the game but it felt like it didn't work in this instance. 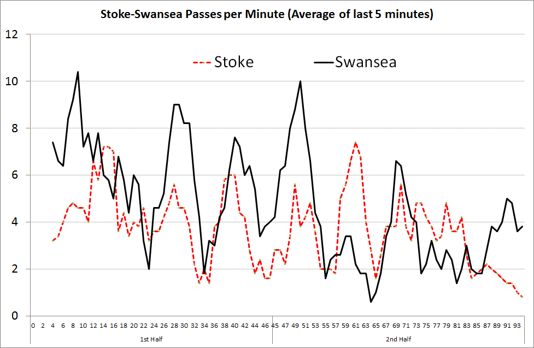 As much as Taylor gets the blame for Stoke's second, it stems from a misplaced pass out of defence from Rangel, one of the things that seemed noticeable in the game was the number of misplaced passes from defence into midfield/attack. There was a lot of focus in the ball played into Bony's feet with his back to goal, a lot of the time it worked well and there was some great hold up play by him at times. 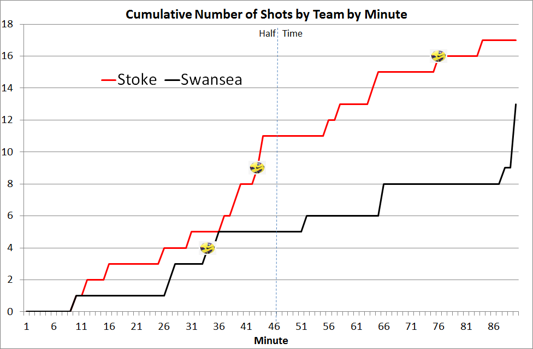 When it didn't work however, either through a bad pas or bad control Stoke often had the opportunity to then break on Swansea's defence. In a follow up blog I'll be trying to put some video's together looking at this in more detail. I was planning on looking at effectiveness from corners anyway but Swansea's stats in this regard make it even more pertinent. From the 7 Premier League games so far this season, Swansea have had 12 corners with the next lowest team being Burnley with 25 (West ham are highest with 53). Why Swansea have had so few is for another blog but this one is concerned with the question of do corners count and who does them well. 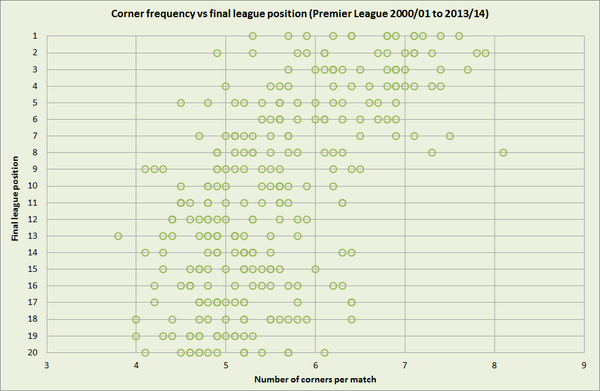 There appears to be some link between corners and final position although I'd expect it to be more 'Good teams win lots of corners' rather than 'Winning lots of corners makes a team good'. There's a good piece by James Horncastle from a couple of years ago looking at a guy in Italy called Gianni Vio who is considered a set-piece guru. He's recently joined AC Milan so is still making a career out of being a set-piece specialist. 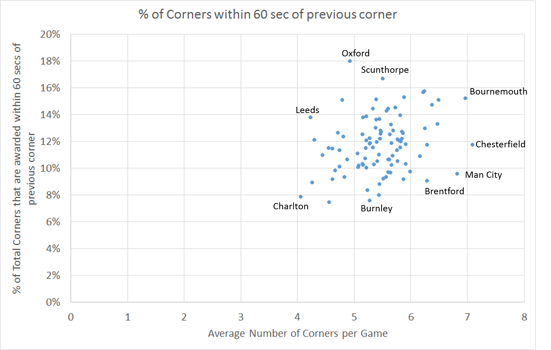 There have been a number of studies looking at the value of a corner such as by Anderson/Sally in 'The Numbers Game' and on Statsbomb among many others. One of the issues is how to credit a goal to a corner? It's easy enough if the goal comes straight from a corner crossed in, but what about the secondary phase after a corner is cleared or if the corner is initially played short? Most previous analysis credits a goal to a corner if it is scored within 3 touches, what I've tried to look at is to use the match reports on the BBC that are generated using Opta data to try and analyse activity in the period after a corner is awarded. The data isn't perfect as the timestamp relates to when it was logged that a corner was awarded and not when taken, but is good enough for some rough calculations. 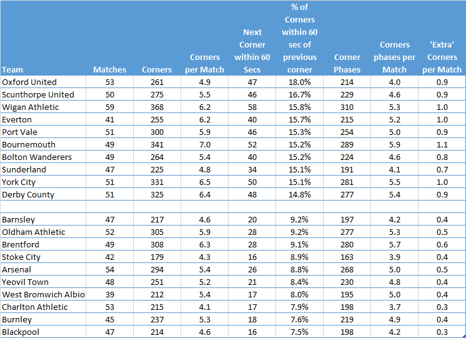 From this data I've gathered information on over 25,000 corners that have been taken in games involving clubs from the English leagues (includes League, Domestic and European cups to try and get as much data as possible even if it risks adding unfair comparisons). These games took place between 1st Oct 2013 and mid-Sep 2014. The first thing I looked at was corners that produce other corners, the aim of this was to remove double counting so at a later stage you could say 'If I get a corner, I'd expect this phase of play to finish in a goal x% of the time'. 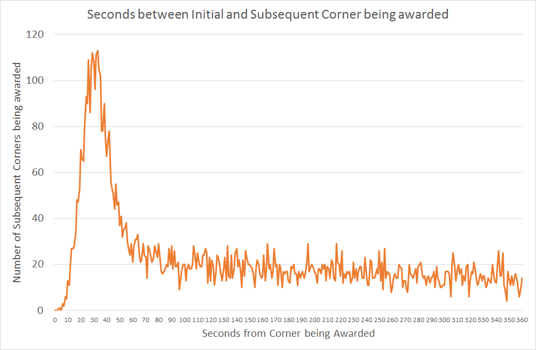 Overall, from the 25,892 corners analysed 3,079 (12%) are awarded within 60 seconds of the previous corner being awarded so could crudely be classed as part of the same phase of play. The linked corners could either be as the result of a shot or due to a defensive clearance (it's there in the data but that's for another day). Corners are all well and good, but ultimately it's goals that count, you know you're clutching at straws if you say '..but we won 8-2 on corners'. 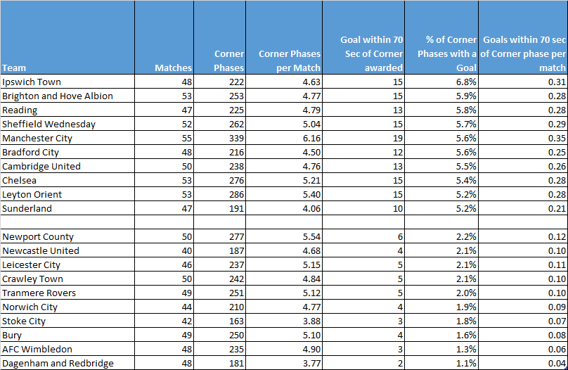 If we look at the last corner in a sequence (where no corner awarded in previous 60 seconds), we are left with 22,813 corners from which to analyse the subsequent goal return. 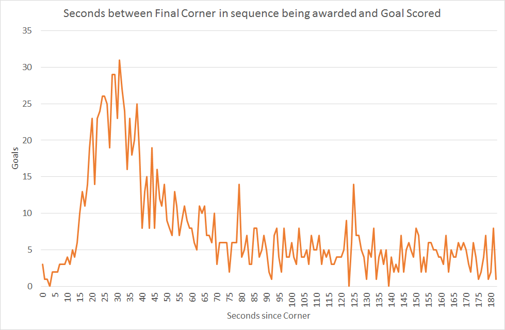 The presence of 3 goals occurring the same time the corner is awarded shows the data isn't perfect but similarly to corners, goal response tends to tail off just after the minute mark. One of the main questions from anything like this is 'Is this repeatable?' are clubs that were performing particularly well/badly in this analysis doing the same previously (and more importantly are they likely to do so in the future)? 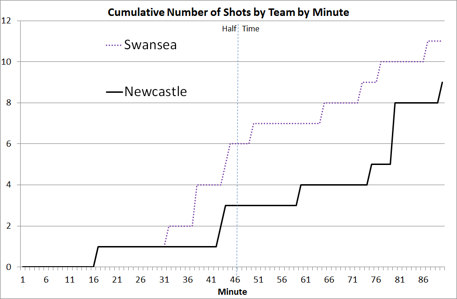 I only have approx 1 season's worth of data in this format but it's interesting to see that the Stasbomb piece that is from Aug 2013 also mentions Newcastle at being bad from corners over a totally separate time period. In an ideal world if you had the Prozone data for example, you could code up all corner scenarios where at least 1 centre back enters the opposition penalty area and link all activity as part of the same phase until that player has returned to his own half. Also, all the timings of events relate to when events entered in to the system and the 60/70 second cut-offs are arbitrary as is the decision to include all games and not just league but the analysis shows the kind of things you could look out for when creating your own bespoke metrics at a club. There's also the risk of conceding on the counter-attack from your own corner that needs to be factored in, Stoke's winner and Chelsea's goal v Man City at the Etihad this season were both breakaway's from Man City Corners. The next stage will be to try and look at what teams that have a higher scoring % do. If the answer to the question 'How do I score as many goals from corner situations as Man City' is 'Buy Silva, Aguero and Dzeko' then that's no use to anybody. 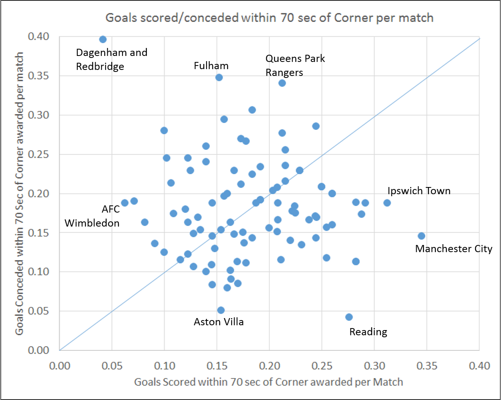 Similarly if Reading's strength in scoring from and not conceding from corners is due to having centre backs who are terrible at everything else that's not much use either, but given there are plenty of less glamorous clubs with high returns from these situations suggests that it could also be process and not just personnel that matters. 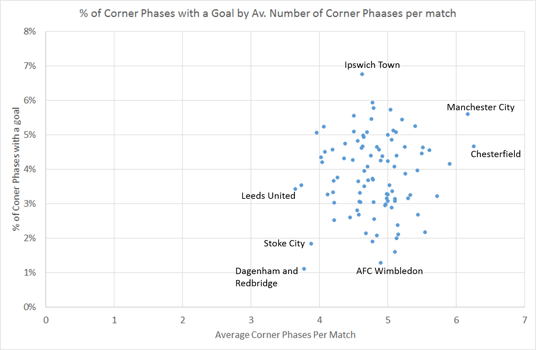 Corners alone won't win you a title or get you relegated but in a game of fine margins, if everything else remains unchanged, well executed corners (and set pieces in general) can make a difference. Positives from this game will be Bony's first of the season and another 2 Gylfi assists taking his league total to 6 (only Fabregas on 7 has higher, with a number of players next closest with 3). Random stat of the season of the season so far is that every other Premier League team has at least twice as many corners as Swansea. Swansea have 12 from 7 games (av. 1.7 per game) with the next lowest being Burnley with 25. Top of the pile is West Ham with 53 (7.6 per game). Off the top of my head 5 of Gylfi's 6 assists have been through balls to create 1v1s against the keeper, as was Jonjo's goal v Chelsea (via a Bony Assist). The John Terry own goal has been the only 'scrappy' goal scored so far this season in the league. Although 1v1 are great opportunities to score is the lack of corners the result of not mixing up play enough, a result of sitting back in some games (either protecting a lead or having 10 men) or just a bit of a freak number?